Introducing Perfect Coffee, A ..
Andytown Coffee Roasters is a brand new cafe in the Outer Sunset neighborhood of San Francisco. We first featured them on Sprudge during our Build-Outs of Summer series, and this past weekend they finally opened their doors, after a week of soft opening. I swung by on Friday, March 21st to chat with owners Lauren Crabbe and Michael McCrory. They both looked battle-worn and exhausted from the final tweaks and preparations, but were upbeat on the eve of their grand opening. The bench outside Andytown offers an impressive view, as Pacific waves crash against a sandy beach just beyond the Great Highway. A steady stream of curious locals wandered in throughout my visit, punctuating our chat. Inside Andytown, last minute equipment breakdowns added to the pre-open excitement, with the roaster broken down to bits and bolts and tools scattered around the shop. Still, you could see the beautiful build-out in spite of the clutter. A giant tabletop and booth dominate the front window. The table is made from a slab of monkeypod, a Hawaiian hardwood sourced from Heritage Salvage in Petaluma. 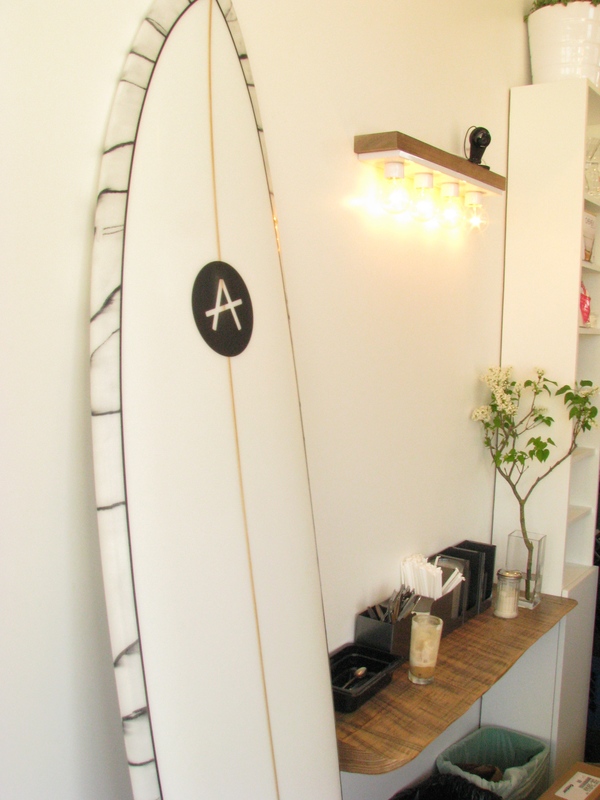 The Andytown-branded sign outside is made from the same distinctive wood. Salvaged wood from Heritage is a dominant theme throughout, including the nice standing bar against the far wall made from what looks like chunks of driftwood. Crabbe and McCrory said that Andytown is all about community, from the neighborhood visitors popping their heads in to the larger coffee community, who’ve waited patiently for more than a year for Andytown to open. Crabbe was a long time Lead Barista at Blue Bottle; the roaster gave its symbolic blessing to Andytown in the form of the Kees van der Westen Mirage Idrocompresso Triplette espresso machine now gracing Andytown’s bar, taken from Blue Bottle’s shop at the currently-under-renovation SF MOMA. The community vibe continues throughout: Andytown’s speakers come from Four Barrel’s Jeremy Tooker, a noted audiophile geek; Patrick Chaffey of Orivor Coffee Roasters will be splitting time on Andytown’s 5-kilo Probat LE-5 roaster. Andytown is sourcing their coffee from InterAmerican. I had a chance to try their Short Strand espresso, a pleasing blend of a natural Brazil and a Washed Ethiopia Yirgacheffe. The shop will also sell a washed Panama Elida Estate coffee as a single origin espresso in the near future. For brewed coffee, I tried their Wind and Sand blend of Colombia Supremo and Excelso coffees. Their blends are for sale in beautiful letterpressed coffee bags from Aesthetic Union, whose distinctive wave pattern and pastel labels are meant to recall the houses and seascape of Outer Sunset. Coffee is being served in custom thrown cups made by their friend Douglas Dowers. Crabbe worked with Dowers to come up with designs that she says represent her perfect latte, cappuccino, and espresso vessels. You can also find mugs with dinosaurs on them, made by a relative in Northern California. Andytown’s food offerings are distinct, owing to Michael McCrory’s upbringing in Northern Ireland’s capital city, Belfast. The menu is set to include cast iron Irish Soda and Wheaten breads, along with scones, cookies, and steel-cut oats for breakfast. Lunch will include seasonal salads, soups and stews. McCrory said that he’s planning a lamb stew and some vegetable soups to be served with “cheese toasties”–something I can only assume is similar but somehow better than a grilled cheese. There was talk of a hood vent, a beer and wine license, and an expanded menu, but that’s all coming at a later date. On my visit I also tried the Snowy Plover, a house-made espresso soda with a dollop of whipped cream that is perfect for beach-side sipping, as well as an exceptional chocolate chip cookie. Apparently, Crabbe and McCrory have been consulting with neighborhood children as a focus group for developing their cookie recipe. The results are not to be missed. It’s been a long journey for Andytown, from build-outs to Kickstarters to months of recipe and service development. The space is now finally, blissfully open, and Crabbe & McRory look forward to serving you soon, perhaps on your way to the beach. Leif Haven (@LeifHaven) is a Sprudge.com staff writer based in Oakland. Read more Leif Haven on Sprudge.